It was another one of those Tuesdays when the book I was busily reading turned out not to have any time travel in it, and so I quickly read a book from my (shrinking) pile of "short time travel books I can read in less than an hour." 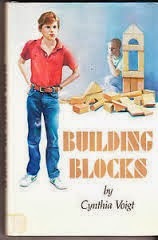 To whit: Building Blocks, by Cynthia Voigt (1984). Brann's parents are at odds with each other. His dad has just inherited a run-down farm in Pennsylvania, and wants to move out to it, his mom wants to start law school in New York. It is the 1970s, after all--and a woman should be able to make something of her own life....And Brann feels battered by their fight about it, so he retreats to the basement, and begins to build with the blocks that were his father's back when he was a kid. And Brann travels through time, and arrives back in the Great Depression, in his father's house, and there is his own father, Kevin, a kid a little younger than Brann. Spending the day with Kevin, and Kevin's family (dictatorial, scary father, worn-down mother, and bratty siblings) gives Brann a new respect for his father's hard-won, quiet courage, and when he comes back to his own time, he's able to come up with a solution that keeps his own family together. It's a simple story, and I remember when I first read it, back many years ago, being somewhat disappointed that more magical-ness doesn't happen. The things Kevin and Brann do together are prosaic--they eat breakfast, look after the bratty younger siblings, explore a cave, and trespass to go swimming. Brann does not run into any time-traveller difficulties; he is accepted as a contemporary kid. But reading it a second time, I have more appreciation for the quite character study that is the book's strength. Poor Kevin really does have a thin time of it, and Brann comes home from his experience a wiser, more understanding person, which puts this one squarely in my "time travel as opportunity for emotional growth" category. Unfortunately I think it edges into "book as an opportunity to push emotional growth on reader" territory, and though it is a just fine book, I don't think I ever need to re-read it again (having grown as much as I'm going to from it). Interestingly, this was a1984 School Library Journal Best YA Book, which I think says a lot about how YA was thought of then and now. 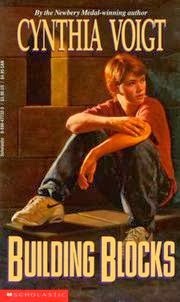 It is just utterly Middle Grade by today's standards--absolutely no hint of an adolescent, let alone teenaged, thoughts, but I guess because Brann is 12, that made it a book for older readers. Plus it is only 121 pages, which is ridiculously short by today's standards (when did books start getting so long? Was it Harry Potter?). Though the 1980s cover (above) looks YAish, Brann gets progressively more childlike in later editions (although he gets to wear the same clothes). (Is there an online archive of SLJ best books of past years? I'd love to browse through it, and a quick search came up empty). Somehow I missed this one (I don't think it would have appealed to me much when I was the right age for it), but apropos of Cynthia Voight, I did love Homecoming and Dicey's Song (which of course won the Newbery). I haven't read either of them in a long time and wonder how they have held up? They definitely seemed "older" to me than other children's books I was reading in the early 1980s. My Voigt books have not been circulating at all. I need to check to see if I even have this any more-- at one point, I had two copies to give to readers who "had" to read speculative fiction and couldn't wade through longer books. Homecoming and Dicey's Song never get checked out. While I normally like exciting time travel, you sold me on this one by saying it's a character study--because I love Voigt's ability with characters. A Solitary Blue is one my favorite books, and that's all on the character exploration.